Thanksgiving is my favorite time of the year to visit family. There’s something comforting about being surrounded with winter and holiday decor and sharing home cooked meals with family. It’s tradition for my sister and I to take our Mom to New York City and watch a Broadway play. And my friend LaToya Little and I do our best to spend “girl time” together. LaToya and I were high school classmates during our sophomore and junior year but we didn’t graduate together due to her relocation to Philadelphia. During that short time, we became best friends and distance never grew us apart. LaToya’s friendship is one of the few things consistent in my life. She is my cheerleader, always there when I need her, and she provides me with great insight and guidance. She knows how to make me laugh, when to push me, and how to manage me when I become stubborn and upset. I trust her. LaToya is my life coach. Last November, LaToya drove up to my parents’ house and spent Thanksgiving weekend with me and my family. I expected to do the usual during the first night – dinner and shopping. “Let’s do a vision board,” she said with excitement. 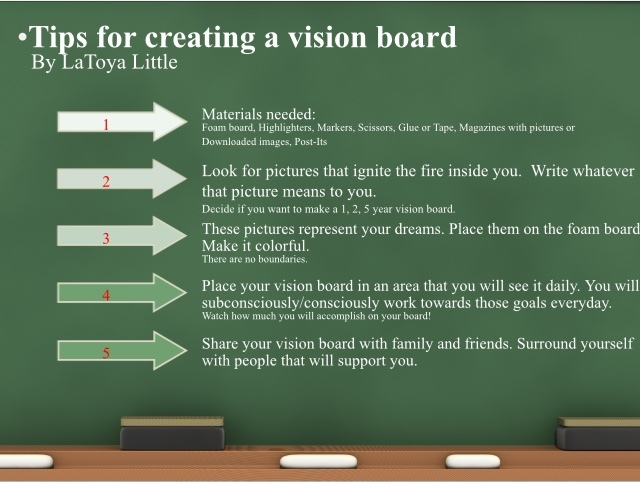 I responded with a confused look because 1) I never did a vision board and 2) sounds boring! Of course I never shared those thoughts aloud but she knew what I was thinking and she laughed at me. She explained how it may benefit me and we soon found ourselves purchasing magazines, glue, colored post-its, foam boards, and scissors. I had some anxiety that evening because I needed to figure out what I wanted to accomplish in 2014. I needed to identify goals. I needed to know what success looks like for me. OMG! After her divorce in 2007 and becoming a single mother, LaToya lost confidence in herself. She gained weight, became depressed, and felt very lonely. She looked the way she felt and didn’t like what she saw. LaToya told herself she didn’t want to live this life anymore and after five years of feeling boxed-in by negative thoughts, she made a choice to finally take control. 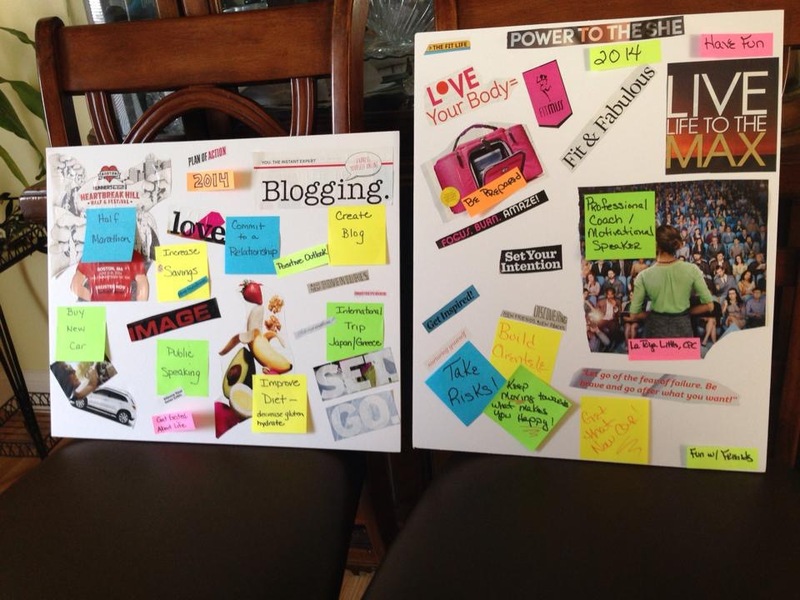 She pursued her passion of life coaching and created a five-year vision board. “I can be the woman I envision myself to be – starting today,” LaToya said. Since 2012, she has accomplished all of her goals with the exception of two but she is confident that she will accomplish these by 2017. LaToya’s accomplishments so far include: purchased a designer messenger bag; obtained a Bachelor’s degree in Business Administration and graduated with honors; and hired a personal trainer to improve her diet and exercise regimen. During my process, I realized that looking for symbols to place on my vision board became easier when no boundaries were placed. I have this need for certainty before moving forward with something and I was frustrating myself by looking for the “perfect” pictures and words to capture my partially thought out goals and accomplishments. “Just cut out things that you like, that resonate or intrigue you,” said LaToya. “It will make sense soon. You’ll figure it out.” She was right. I cut out pictures and wrote words that made my heart sing! Then I placed the ones that I truly wanted to do onto the white foam board. LaToya also encouraged me to be creative and to stretch myself. 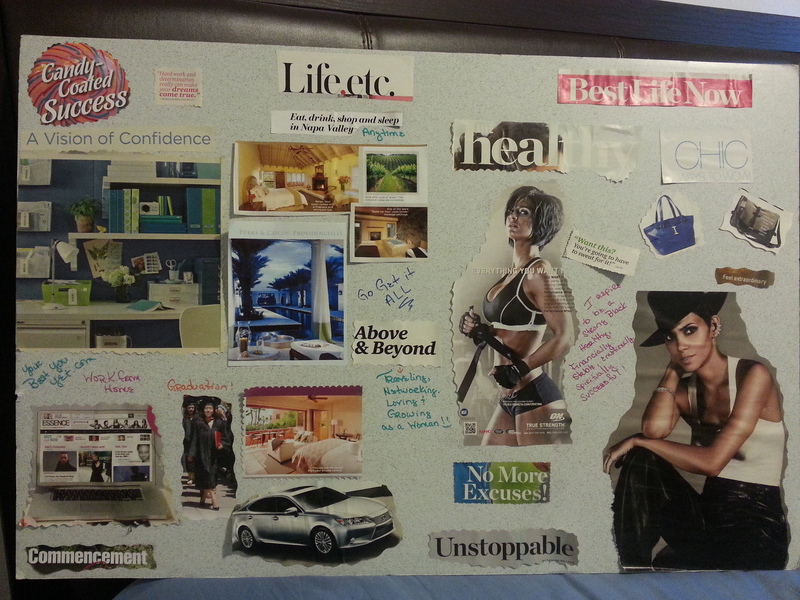 Within 24 hours, we created a vision board for 2014. The year is now coming to an end and we are proud to say that we have accomplished nearly all of our goals and working on completing the remaining goals by year’s end. Looking at my vision board now, I am amazed on how much was accomplished: I bought a new car, created a blog, and traveled to Japan. Pausing for a moment to reflect on what you achieved is a powerful motivator and confidence booster. I am grateful to LaToya for introducing me to this amazing tool. It helped me define my own success and because of this, I can truly say that I love the life I am living. She ended up buying 3 designer bags!! I love this stay focus!! This is so inspiring. Yes, try it and see how the process works for you!